There’s something magical about stargazing on a crisp winter night. When the atmosphere is still and cold and clear, the stars seem to blaze brighter. 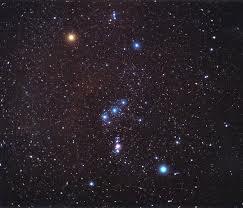 And in a winter sky ablaze with sparkling stars and conspicuous constellations, Orion the Hunter dominates all. Orion is easy to find this time of year: Just look in the southeast a little after sunset for a line of three medium-bright stars. That’s Orion’s belt and, once you’ve found it, you can easily pick out the rest of the constellation. Orion reaches its highest point in the southern sky about 9 p.m. during the first part of February, and about 7:30 p.m. during the latter part of the month. The bright, distinctly orange star to the upper left of Orion’s belt is Betelgeuse, pronounced — more or less — “beetle juice.” Betelgeuse, which represents one of Orion’s shoulders, is about 650 light-years away. It is one of the brightest stars in the sky and is incomprehensibly huge. If Betelgeuse replaced the sun in the center of our solar system, its surface would extend beyond the orbit of Mars. Think of it this way: If the sun were the size of a grain of salt, the Earth would be an invisible speck about 2 inches away. Betelgeuse would be the size of a cantaloupe. The star marking Orion’s other shoulder, above and to the right of the belt, is Bellatrix. It is about 240 light-years away and is roughly 4,000 times brighter than the sun. From left to right, the belt stars are Alnitak, Alnilam and Mintaka. If you’ve ever wondered how big a degree is, remember Orion’s belt — the three stars are about 1 degree from one another. Rigel, the brightest star in Orion, represents the hunter’s left knee (on the right as he faces us). It is around 800 light-years away and has a small, bluish companion star, but you’ll need a telescope to see it. The star representing Orion’s other knee is Saiph. Saiph and Rigel are tens of thousands of times brighter than the sun. One of the most glorious sights in the sky floats a little below Orion’s belt in the hunter’s fainter sword. The Great Nebula of Orion, also known as M42, appears to the naked eye as a fuzzy star, one of three in the sword. Binoculars reveal a small, faint patch of wispiness, but a telescope shows the nebula as an extended cloud, full of detail. In most photos, the Orion Nebula looks pink and blue, but through a telescope, it appears grayish white, with a hint of green. Astronomers say the nebula, a gas and dust cloud about 24 light-years across, is an interstellar nursery. Deep within its fan-shaped depths, huge globules of gas condense from the surrounding material, becoming denser and denser, hotter and hotter. Once their cores reach the temperatures and pressures needed to sustain nuclear fusion, voila! a star is born. Those young, hot stars make the nebula glow. Even urban skygazers should be able to spot Orion’s belt, shoulders and knees. If you’re observing from a dark location, you’ll also be able to see a fainter, vertical row of stars to the right of Orion. They represent his shield, while an even fainter group of stars to the left and above Orion represent his upraised arm, holding a club. Orion, one of the oldest constellations, is mentioned by name in the Bible and the Iliad. It was especially important to the ancient Egyptians, who knew Orion as Sahu, an incarnation of Osiris, their god of the underworld. Some have argued that the three stars of Orion’s belt represent the three major pyramids at Giza, which, like the belt stars, lie almost in a straight line. Jupiter and Venus are can’t-miss sights in February. As the month begins, Venus, the brighter of the two, shines brilliantly in the southwest, then drifts more to the west as the month progresses. Jupiter, nearly as bright, hangs high in the south-southwestern sky after sunset in early February but drifts closer to Venus throughout the month. They’ll reach their closest approach to one another in March. Look for a sliver of a crescent moon low in the west after sunset on Wednesday, Feb. 22. The planet Mercury is to the left of the moon. A slightly fatter crescent moon hangs a little above and to the right of Venus in the west on Saturday, Feb. 25, and a little to the right of Jupiter the next evening. February 3 – Full Moon. The Moon will be directly opposite the Earth from the Sun and will be fully illuminated as seen from Earth. This phase occurs at 23:09 UTC. This full moon was known by early Native American tribes as the Full Snow Moon because the heaviest snows usually fell during this time of the year. Since hunting is difficult, this moon has also been known by some tribes as the Full Hunger Moon. February 6 – Jupiter at Opposition. The giant planet will be at its closest approach to Earth and its face will be fully illuminated by the Sun. This is the best time to view and photograph Jupiter and its moons. A medium-sized telescope should be able to show you some of the details in Jupiter’s cloud bands. A good pair of binoculars should allow you to see Jupiter’s four largest moons, appearing as bright dots on either side of the planet. February 18 – New Moon. The Moon will be directly between the Earth and the Sun and will not be visible from Earth. This phase occurs at 23:47 UTC. This is the best time of the month to observe faint objects such as galaxies and star clusters because there is no moonlight to interfere. February 22 – Conjunction of Venus and Mars. A conjunction of Venus and Mars will be visible on February 22. The two bright planets will be visible within only half a degree of each other in the evening sky. Look for this impressive sight in the west just after sunset. So recently I’ve received quite a few requests for some quick pie iron fixes. I’m not tagging these with my normal mantra of “Cooky Jason’s World Famous” because these are so very basic and common and have been around forever. Although the recipes below have some of my personal touch the idea here, as always, is just to give you some ideas to try. Experiment or alter to taste. Also, as always, I like to prepare as much as possible at home and transport to the campsite in air tight containers as to avoid handling raw meat at the campsite. And these are a good way to get kids involved in the cooking. If you don’t have pie irons, you should really consider them. They can be found very easily online and are inexpensive. You can do these recipes over an open fire or a grill top. Enjoy! I highly recommend against using garlic salt or garlic powder here. Fresh (ish) really is the way to go. The above quantities are per serving, but what I like to do is make the garlic spread ahead of time and simply keep it in airtight bowls and chilled. In that case you can multiply the ingredients based on how many servings you want to be able to make. Very simply, chop the garlic fine and then add salt to it right on the cutting board. Then turn your knife on its side and massage the salt into the garlic until you have a paste. Put the paste into a bowl and stir in the pepper and olive oil. You can also just do this in a food processor. Then when you’re ready, butter two slices of the bread of your choice (or even pita). Place bread slices into pie iron with buttered side down. Then spread garlic mixture onto open face of bread and add mozzarella and basil ribbons. Close and lock pie iron. Cook over fire about 3 minutes per side. Excellent. OK, so we’re using the term “taco” here kind of loosely. And normally I’m vehemently against using packaged seasoning mixes. But in this case we’ll make an exception in favor of short prep time. So again, the above quantities are per serving. Brown 1 pound ground beef, pork, or turkey. Add taco seasoning mix and water as per package directions and cook as directed. Store in airtight container for transport. You can do this with tortilla shells or bread. Both work great. Just use a little olive oil for tortillas or a little butter for bread. In either case, oiled/buttered side always down. The spoon on your ground meat and veggie mix, careful not to over fill. Sprinkle on cheese. Close and lock pie iron. 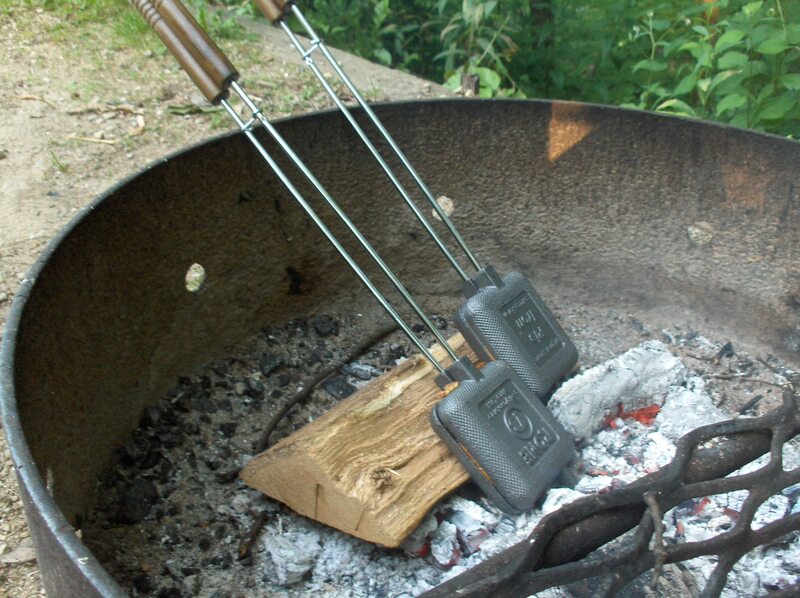 Cook about 3 minutes per side over open fire or grill. Delicioso. While we offer a full warranty and repair services on our products, sometimes damage can occur while on a trip, and being prepared to make effective field repairs can save the day and prevent a good trip from turning bad. Field repairs are often necessary and having a repair kit on-hand is always a smart idea. A small tear in a tent can worsen quickly, but it’s easy to repair even on the trail. Carry mending materials with you to keep your tent secure. Time: 10 minutes to 1 hour, depending on the damage. Most rips, tears, and leaks occur because a tent has been pitched too rigidly; find ways to set up your tent so that it can flex in high wind conditions. Always use shock cords. Check your campsite for dangerous limbs, projecting roots, and sharp rocks that could cause damage; if you must pitch your tent on a hazardous site, pad sharp rocks and clear away debris before pitching it. Rips and tears. To mend small tears, cover the damaged, on both sides, with adhesive tent patches. Apply a liberal amount of seam sealer around the edges of patches on both sides of the tear, smoothing the edges of the tape carefully to prevent snags and leaks. Patches come in different sizes and shapes. Try to use patches that are at least an inch larger than the rip on all sides. You can use more than one patch on each side if necessary. Large tears must be sewn closed or patched with repair tape. There are Outdoor Sewing Kits available from Gear Aid. If the tear is in a part of the tent where extra pressure doesn’t matter, turn the top edge of the tear under about 1/4 inch and stitch the turned fabric over the outside of the bottom torn edge, using a sewing awl and strong waxed thread, forming a new seam. Plan your sewing to account for water runoff; turn the edges of the patch to create a shingle effect to shed water, not a shelf to hold it. Make your stitches short and close together; double seams are strongest. To ensure a watertight seal, apply a bead of seam sealer to the bottom edges of the overlap or patch, on the outside of the tent. Patch holes or tears in tightly stretched areas of the tent with strips of repair tape cut at least 1 1/2 inches longer and wider than the damage; if necessary, overlap strips in a shingle pattern to cover the damage completely. Tape both sides of the damaged area, and seal all edges of the tape with seam sealer, inside and out. If the patch isn’t sturdy enough, replace it when you get home with a patch of tent fabric. But the best thing to do is, after your camping trip is over, get your tent to a proper repair shop where more permanent repairs can be done. Grommets. Tears around grommets require the removal of the old grommet and replacement of the damaged material. This typically requires special tools and presses to accomplish, although there are temporary grommet kits available and it doesn’t hurt to have some on-hand. Leaks. To stop a leak in the rain fly or upper surface of your tent, apply seam sealer when the fabric has dried out. Leaks in the floor are probably the result of tears. 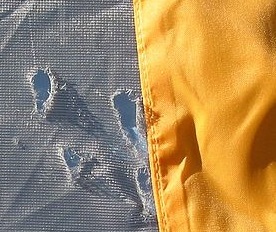 Locate and repair the tear; be certain that the ragged part of your seam is on the inside surface of your tent. Seal this seam. To protect the patch, cover it with repair tape. To prevent any further damage to a waterproof floor, use a Footprint under your tent.